Jotter has two fields: email address (which it remembers from your last session) and message. After you type your message, hit Enter, and the Jotter sends the note to your email inbox. Jotter also gives you the option to Jot Again, if you’d like. Many phone services let you send text messages to email addresses, so save your email address as a contact and use it to send yourself quick notes and reminders on the go. You might not know this, but you can add a + and then any word you’d like to your Gmail address, and it’ll still go to your inbox. So, if your Gmail address is user@gmail.com, you can create thousands of email addresses that all end up in the same place: user+spam@gmail.com, user+facebook@gmail.com, user+tasks@gmail.com. I used this to set up Jotter to email me at myemail+tasks@gmail.com, and then set up a Gmail filter to auto-label those messages. If you’re a smartphone user, you might be wondering, “Couldn’t I just open my email program and write a message to myself?” Yep. You could. The benefit of these programs is that they make the proces of emailing yourself a few seconds faster–and when you need to jot a quick note, those few seconds can be precious. 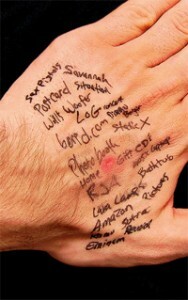 Do you have any other clever tips for sending yourself notes on the go? Leave them in the comments. Category: Time & Task Management | Tags: android, captio, gmail, ios, jotter, webos | Permalink | Post a comment | Trackback URL. great post. as someone without a smart phone I do use the text to my own email trick you mentioned above. that combined with an inbox zero philosophy means I have to deal with the note before I can reach inbox happiness. I use an app called colornote on my HTC hero (it’s available in the Android marketplace). You can color-code your notes (eg work notes are yellow, housework orange, not urgent purple), set a due date and time, type in text or checklist form. If you have a lot of notes, you can search through them- just remember to add a keyword or tag them yourself.